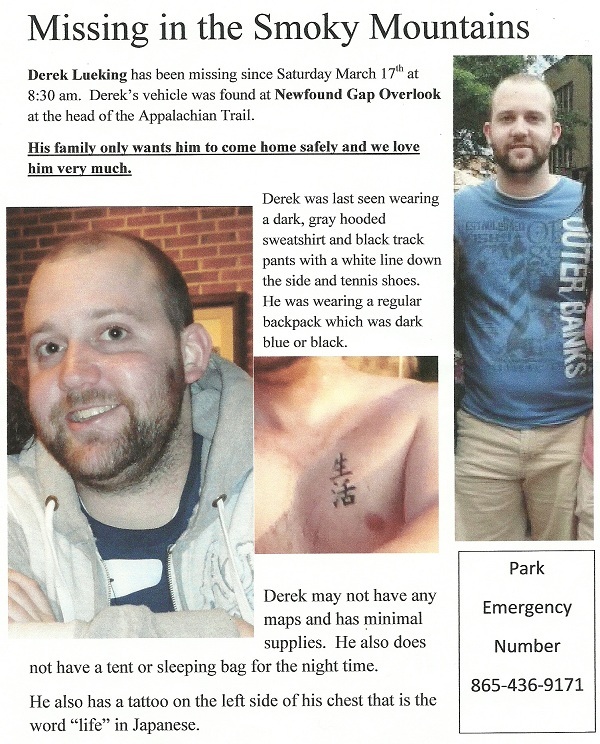 This man has been missing since Saturday morning, March 17th in/near the Great Smoky Mountains National Park. He was last seen at a motel in Cherokee, NC. Park Rangers feel he may have become disoriented and be hiking off established trails or even along nearby roadways. Please pass this information along to your contacts and re-post in your blogs. Sometimes missing people are found miles from where they were last seen. A lot of us cycle in this area. Who knows… he may be found by one of us. According to a Park Ranger I spoke with yesterday this man is still missing. There’s little hope of finding him alive, yet stranger things have happened. If you have seen this man ANYWHERE please call the number listed on the flyer below. Also, if you come across anything that resembles an abandoned campsite while hiking please let the Rangers know this as well.